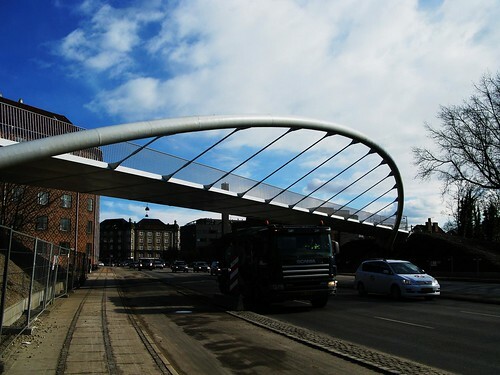 Aabuen - The cycle and pedestrian bridge on the Copenhagen Bicycle motorway. Now this is taking bicycle infrastructure to the next level. Denmark's second city has approved funding for construction of a so-called luxury Super Bicycle Route [call 'em cycle tracks if you want] from the centre of the city to the suburban town of Lystrup. Aarhus has a modal share for bicycles of about 25% and they have always lagged behind Denmark's third-largest city, Odense and the capital, Copenhagen, with regards to promoting cycling. But these days, with all the focus on cycling infrastructure both here and abroad, it seems like a friendly competition is breaking out. A race for high-profile cycling projects can't be a bad thing. Prestige AND increased numbers of cyclists. A win-win situation. 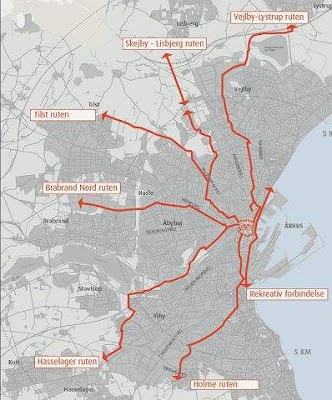 In Aarhus there are a number of main cycle routes planned but the city council agreed to finance the Super Bicycle Route first before the others are begun. 15 million kroner [ca. €2 million] is earmarked for the project, which will be about 10 km in length. The first super bicycle route will be a part of six super routes that are planned, fanning out from the town centre. So... what's a Super Bicycle Route? There will be service stations along the way featuring air pumps and drinking fountains for cyclists, underpasses under the larger main roads to keep the flow moving and a Green Wave, like in Copenhagen where cyclists will hit green lights the whole way if they maintain a certain speed. On Copenhagen's Green Wave routes it's 20 km/h. The bike lanes will be double as wide as they are now and at the end of the route in Lystrup there will be... get this... Park 'n Ride for commuters. Those who use the Djurlands motorway from the north, heading for Aarhus, can park their car and then hop on their bicycle for the last 10 km. 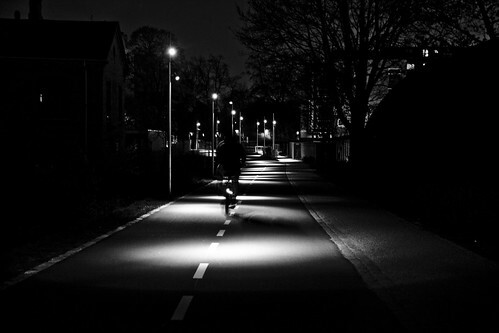 Part of the Green Path, Copenhagen's bicycle motorway, by night. The traffic department think that the new super route will be so lovely and effective that it will encourage commuters to park their cars. Wonderful stuff. Innovative ideas. Let's hope Aarhus' modal share increases with this and other projects. It's not everyday I have news from Aarhus, but a legendary mayor of the city, Bernhardt Jensen - known as the Cycling Mayor - will be honoured with a statue in the city. 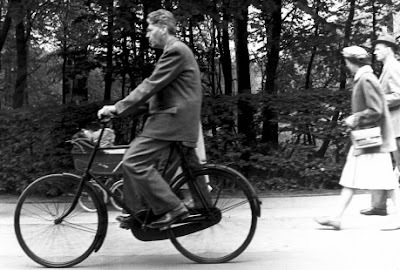 He was mayor from 1958-1971 and was well-known for ditching his car in favour of the bicycle. This at a time when cars were starting to conquer the streets. He was chosen as the greatest citizen of the city of Aarhus and I'm hoping the statue features him... on a bicycle.